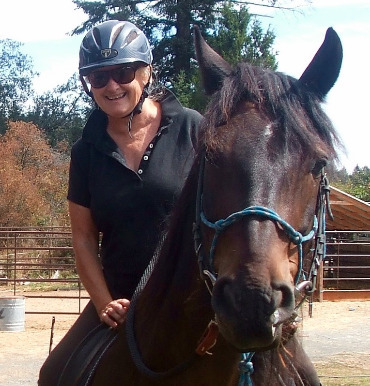 Natural Horsemanship on Orcas - Helping people and horses connect! When horses follow your leadership happily, with no resistance, you know you are on the right path. They tell me they are looking to connect. 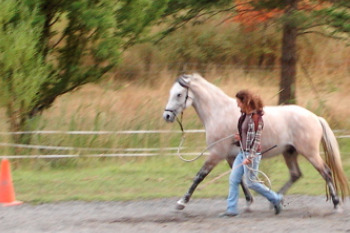 Unlike the tradtional horse training methods that follow a dominance model, based on learned helplessness. I use positive and natural methods that create an interspecies bond. Working with horses is about being in the NOW! the soft eye or the loosely swinging tail. Most importantly, you will learn to work with the horse, not against him. Once you have a bond, everything is easier! for safety, companionship and leadership. You will learn to use psychology,knowledge and understanding rather than the more tradtional methods which involve force, mechanics and fear. Learn to communicate like a horse. Horses use touch, eye contact and movement to communicate - often very subtle movement: a twitch of an ear, a sideways glance. They are keen observers, as prey animals their lives depend on it. If you want to be successful in your communication with horses, you need to become a keen observer as well. A good leader does not need force, instead you can learn to be observant, focused and use proper timing to communicate with horses. The keys to the heart of a horse. How we learn to relate to a horse will mirror EVERY relationship we will ever have -most importantly, the one we have with ourselves. "Kat's workshop was like swimming in the sea of accelerated learning - it was perfect!" 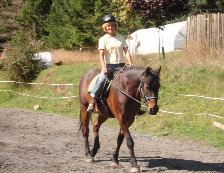 'I have never had an experience working with horses, (even my own) like working with Kate's mustangs! It is transformational! lots of us have them!
" Kate! Leo & I had a great time today! I just slowed down and was relaxed and was more clear and he was so responsive... my goodness, he is so darn sensitive and responsive, it blows my mind! " You are certainly a poster child for what I hope people can have the opportunity to experience.